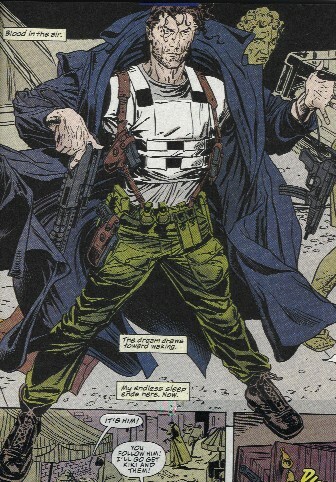 Powers/Abilities: Sal had no superhuman powers, but was skilled at street fighting and the use of various firearms, in addition to controlling many other mobsters. Following the transformation into Thorn, he no longer needed to eat, drink, or breathe, was immune to cold, and could recover from otherwise fatal injuries. He no longer gave off the scent of a living being, as well. He used a variety of ballistic weapons. Height: 5'11'' Weight: 190 lbs. (Punisher War Zone#1) - Sal served as second-in-command to his brother Julius in the Carbone crime family. The two were seldom in agreement. Both were present when Mickey Fondozzi introduced his cousin, Johnny Tower (actually Frank Castle, the Punisher). (Punisher War Zone#2) - Sal took an instant dislike to Tower, and blamed him for the many deaths on the Carbone side when he and Fondozzi led an assault on the DePaninis. Similarly, when all present at a Carbone operation were killed, Sal suspected an inside job, possibly by "Tower" or Fondozzi. Julius sent those two out of the room while he argued with Sal. Sal was right, of course. (Punisher War Zone#3) - Fondozzi and "Tower" followed Sal, learning that he was involved in side operations with Asian criminals. They took photographs and showed them to Julius Carbone, leading him to believe that Sal was a traitor. Julius sent "Tower" and Fondozzi to capture Sal, and they drugged him and drove him out to New Jersey to dump him there. However, Sal's past use of narcotics gave him resistance to the drugs he'd been injected with, and he recovered prematurely, overpowered Fondozzi, and leapt from the car. Fleeing from his attackers, Sal ran out onto thin ice and fell through into the freezing waters below. After seeing his body floating lifeless beneath the ice, "Tower" and Fondozzi left him for dead. The next day, Sal's body was discovered still partially in the freezing waters, over four hours later. Though hypothermic and bradycardic (low heart rate), he was still alive. (Punisher War Zone#4) - Sal began to regain consciousness in a New Jersey hospital. Regaining his strength, Sal escaped the hospital. (Punisher War Zone#5) - Sal killed a man, took his Rolex, and used that to pay a guy to give him a ride. Unable to remember his own name, he took the name Thorn after seeing it on a billboard. He continued to follow his brother's path to la Isla de Tiburones Durimentes (the Island of the Sleeping Sharks), seeking vengeance for his near murder. (Punisher War Zone#6) - Thorn completed the remainder of the journey by leaping into shark infested waters and swimming to the island. Upon emerging from the waters, he encountered Rosalie, and killed her fianc� Enrico. This drew the fire of other mobsters present, and the death of the son of the Sicilian family there brought on a war between his family and the Carbones, whom he blamed. Thorn found Julius and knocked him into a shark-filled grotto. The sharks killed Julius, but took no interest in Thorn. As he climbed out, the Punisher shot him repeatedly, and he disappeared beneath the surface in a pool of blood. However, he survived, and managed to make it swim back to his ship, where he recovered, and plotted vengeance on the men who had "killed" him. (Punisher War Zone Annual#2) - Thorn killed a trio of drug dealers, stole their car, and headed back to New York. He tracked down Fondozzi, but was then attacked by some criminals seeking to steal his car. This distraction gave Mickey time to escape, though Thorn stayed on his trail. However, by stealing the drug dealers car, he earned the enmity of their boss, Kiki, who sent his men after Thorn. Mickey told Castle about Sal, and Thorn found his two killers together. As he fought Castle, Kiki's men attacked, but they were quickly wiped out by Thorn and the Punisher. Thorn continued to pursue Castle and managed to get the drop on him, but Kiki and the rest of his agents attacked them. Thorn slew them all, but then Castle knocked him off a bridge and onto a moving truck on the highway below. Thorn was last seen walking in the rain in Newark. Comments: Thorn created by Steven Grant (writer) and Hugh Haynes (artist). One MIGHT suspect that Sal Carbone was a latent mutant, as there were no mutagens involved in his transformation. 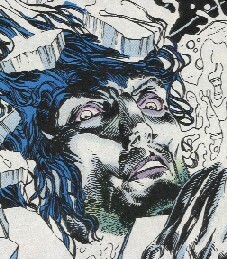 Thorn's height and weight were revealed in the Marvel Knights Encyclopedia (2004). THORNOIDs - weapons/agents of Dire Wraiths, used against Rom, killed Artie Packer.